Lynn performs solo~vocals and guitar or with a band that is comprised of Steve Wolf (bass), Dave Abe (violin, fiddle, penny whistle) and Jimmy Brink (percussion). Harmony vocalists include Keely Hollyfield, Carey Creed and Mary Gordon Hall. 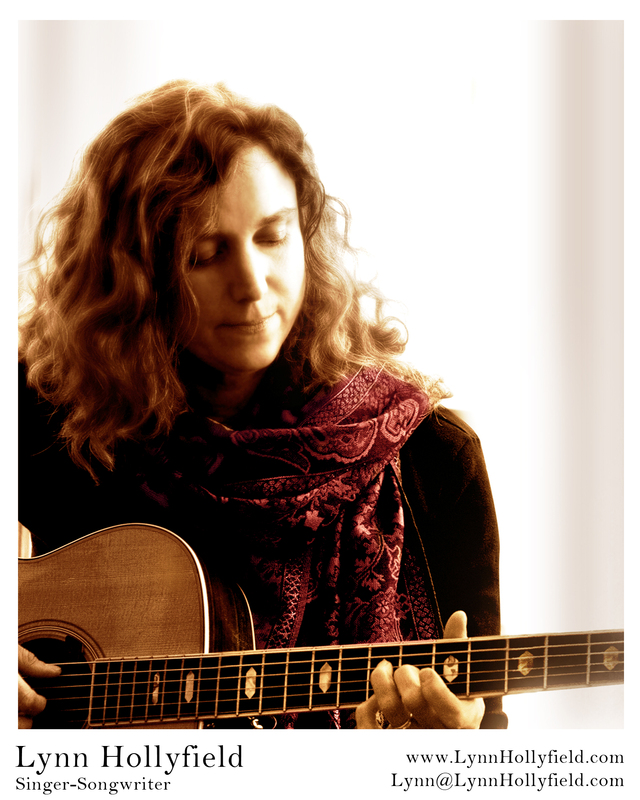 Lynn has opened for Jesse Winchester, Loudon Wainwright III, Kate Campbell, Tret Fure, Bill Staines, Christine Lavin, Caitlin Canty and Jonathan Byrd. 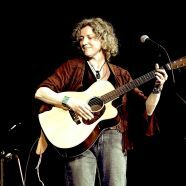 Lynn has performed at various venues: The Birchmere, RAMS Head, The Cellar Stage, Institute of Musical Traditions, The Washington Folk Festival, The Takoma Park Folk Festivals, Brewer's Alley, George Mason University and numerous house concerts/Wedding events. Blend a powerful singer, crisp acoustic guitar player and a heartfelt observer of the world and you have singer-songwriter, Lynn Hollyfield. Her "indie-folk-pop style" (Leicasterbangs, UK) reflects an infusion of many influences including great jazz artists, such as Ella Fitzgerald, to contemporary influences of John Hiatt, Shawn Colvin and CSNY. The resulting blend~her own voice mingling wit, a silky sweetness and thoughtful reverie to her songwriting and performance. Hollyfield's second solo recording, In The Balance, was released the end of April 2014. The album was funded in part by a successful Kickstarter campaign, where Hollyfield raised a total of $14,500 on and offline in a one-month period. In the Balance, is currently on the Folk DJ charts. John McLaughlin, Folk DJ-WU/This Digital Folk Life/Facebook, reviewed In The Balance and stated, "there's a range of moods and emotions captured in this music; it's a beauty." In The Balance is a compelling collection of 12 original songs set in arrangements that highlight Hollyfield's skillful guitar playing and her inviting, rich vocals. In The Balance was listed in the TOP ALBUMS for 2014 on the FOLKDJ Listserv as was her first album, Layers, in 2010. 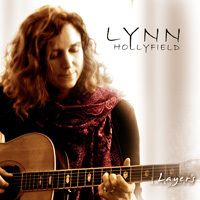 Blend a powerful, passionate singer, a crisp, acoustic guitar player and a heartfelt observer of the world and you will have, singer-songwriter, Lynn Hollyfield. Hollyfield's roots hail from Staten Island, NY when she picked up the guitar at age 10 and ran with musical influences she experienced from home. 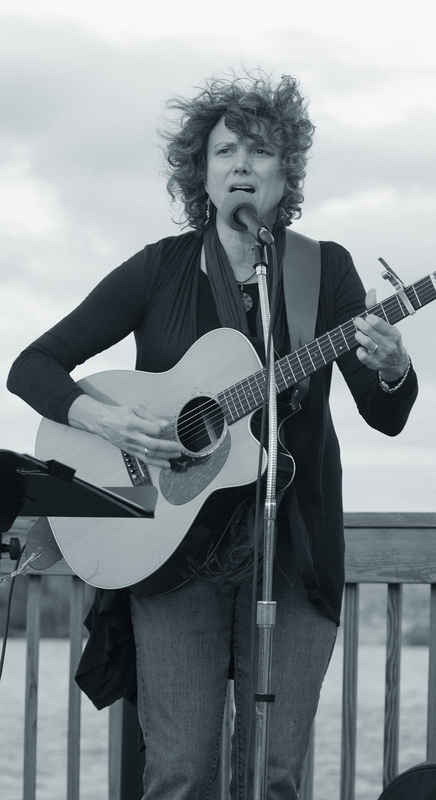 From great jazz artists such as Ella Fitzgerald and Billie Holiday to the Beatles, Cream and CSNY, Hollyfield launched into her own songwriting infusing these influences to create a diverse repertoire of contemporary folk, pop, blues and jazz. Hollyfield's highly anticipated second solo recording, In The Balance, was released the end of April 2014. The album was funded in part by a successful Kickstarter campaign, where Hollyfield raised a total of $14,500 on and offline in a one-month period. In the Balance, is currently on the Folk DJ charts. John McLaughlin, Folk DJ/This Digital Folk Life.org, reviewed In The Balance and stated, "there's a range of moods and emotions captured in this music; it's a beauty." In The Balance is a compelling collection of 12 original songs set in arrangements that highlight Hollyfield's skillful guitar playing and her inviting, rich vocals. Hollyfield worked with award winnning produced, Marco Delmar at Recording Arts along with an accomplished array of area musicians including Carey Creed, Grace Griffith, Mary Gordon Hall, Marcy Marxer, Steve Wolf, Brian Simms, Dave Abe, Jimmy Brink and Kristen Jones. In The Balance is comprised of 12 originals 3 of which are collaborations with Carol Burbank, writer/poet/healer www.storyweaving.com. 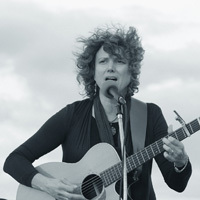 Layers, her first solo recording, exploded on the folk scene in 2010, receiving air play and positive reviews-nationally and internationally-marking her as a rising star of contemporary folk. Layers, marks a turning point in her work, and brings together her wit, silky sweetness and a thoughtful reverie to her first, solo recording. "Her indie-folk-pop style would have (her) opening up for 10,000 Maniacs or Cowboy Junkies." (Leicasterbangs, UK). Lynn in fact has opened for headliners including: Jesse Winchester, Loudon Wainwright III, Jonathan Byrd and Christine Lavin. Layers, "presents a pensive, roots-driven collection, which feature the artist's angelic voice and fluid guitar picking." (Dickson Mercer, Maryland Independent). Well received by the Folk community, Layers became listed as one of the Top Albums of 2010 on the Folk DJ Playlist and in the Top 99 Albums of 2011, Dan Herman's Crystal Blue Radio Program. "Hollyfield's songs are beautiful and contain a universal wisdom we can all identify with. (Her songwriting) celebrates the truly important things in life � the journey not the destination. A wonderful CD you can listen to over and over and discover something new each time." (Jane Woods, Fanrealm.com). The Album graced the artist with three WAMMIE (Washington Area Music Awards) nominations~Best Contemporary Folk Recording, Best Debut Album and Songwriter of the Year (2011). Her songwriting received recent Honorable Mentions in the MASC (Mid-Atlantic Songwriting Contest) and The Indie International Songwriting Contest-Folk Category. 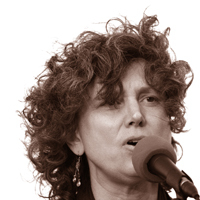 "Lynn is a wonderful singer-songwriter," states Steve Wolf, Bassist (Swingspeak and Tom Principato). "Your songs are mesmerizing..." Carol Lite, Co-Chair of the Program Committee, Washington Folk Festival 2011. Hollyfield's vocals have developed since her early musical endeavors as part of the duo, Hollyfield & Spruill, who released two recordings, Slipping Time and Blue & Green. 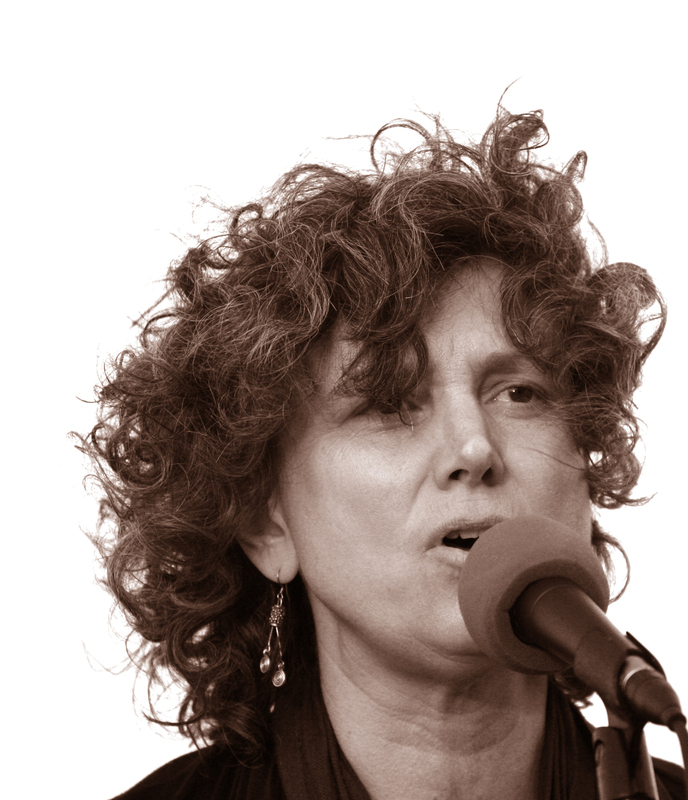 Recently described as "the warmest voice since Christine McVie," by Ron Goad, percussionist, SAW (Songwriter's Association of Washington-Board of Directors) and "a most gorgeous tone, I could listen to your voice all day..." Lynn Veronneau, Jazz vocalist. Hollyfield received a WAMMIE nomination for Best Contemporary Folk Vocalist 2011 and 2012. "I love hearing your voice....so rich, gentle, comforting and inviting," writes Amy White, Award Winning Musician (Al Petteway & Amy White). 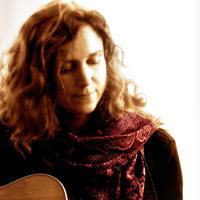 Hollyfield supports her vocals and songwriting with her accomplished guitar playing. She performs on a regular basis with Grace Griffith-Singer, Multi WAMMIE Award Winner, Washington, DC Icon and Blix Street Recording Artist, who describes her playing as "strong, solid and right on time." Hollyfield continues to perfect her craft and recently attended the Kerrville Folk Festival Songwriting School, Kerrville, TX and the Northeast Regional Folk Alliance Conference, NERFA, in Kerhonkson, NY. In addition to performing throughout the Northeast, Lynn Hollyfield, supports other local musicians and songwriters by hosting the monthly, SAW Open Mic (Songwriter's Association of Washington) at the New Deal Caf�, Greenbelt, MD and is a founding member and producer of five concerts at the volunteer run, Homegrown Coffeehouse, held at the National Colonial Farm-Accokeek Foundation, Accokeek, MD since 1999. Finalist in the Mid-Atlantic Songwriting Contest: JAZZ/BLUES VOCAL Category for "Warm Me from the Winter Wind." Semi-Finalist, Bernard Ebb Songwriting Contest for 3 songs-waiting to progress to Finalist position to perform for the Grand Prize $10,000! Honorable Mention in Mid-Atlantic Songwriting Contest-Children's category for "The Tree, The Ship and Me." Lynn listed in the TOP Artists-Radio Crystal Blue Podcast for 2016. Lynn's song INSIDE OUT was featured in the Goddess Diaries, a play by Carol Campbell. Lynn performed the song as part of the theater presentation at George Mason University. Received a WAMMIE NOMINATION for Best Contemporary Folk Vocalist, Washington Area Music Awards. Invited to showcase at the SSCAPEMAY-Singer-Songwriter Conference, March 18, 2016. Received 4MASC Wins: Mid-Atlantic Songwriting Contest Honorable Mentions for Because of You and Winter's Gift in the Folk category, Fear the WInd in the Adult Contemporary Category and Life and its Beauty in the Vocal Jazz/Blues category. Listed in TOP 99 Artists for 2014 by Radio Crystal Blue. Received a WAMMIE nomination (Washington Area Music Association Awards) for Best Contemporary Folk Vocalist. Listed in TOP 99 Artists for 2013 by Radio Crystal Blue. Lynn ran a successful 'Kickstarter' (crowd funding) campaign and raised $14,500 (kickstarter $10,800 and off-line donations of ~$3,700) for her next recording. Here is a link to the campaign: CLICK HERE TO VIEW MY KICKSTARTER PROJECT! Listed in TOP 99 Artists for 2011 by Radio Crystal Blue. 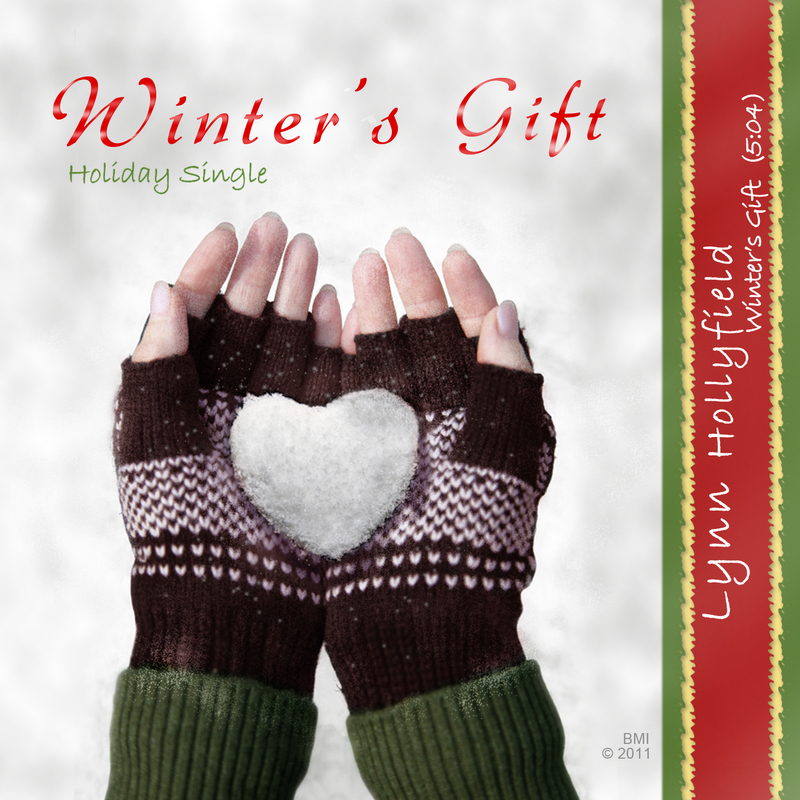 Winter's Gift-Lynn's new holiday single, receives radio airplay. Washington Area Music Association: 4 WAMMIE Nominations for Best Contemporary Folk Album, Best Contemporary Folk Vocalist, Best Debut Recording, Songwriter of the Year. MASC Winner! Boats Gone by and Layers received Honorable Mentions in the Folk Category of MASC (The Mid-Atlantic Song Contest) 2010! LAYERS is listed as one of the TOP ALBUMS OF 2010 and in the TOP ARTISTS of 2010 as compiled by Richard Gillman from FOLKDJ- radio playlists! John Rumsey, FolkDJ with WKVR, 89.3FM, Folk Alley named LAYERS in his final TOP 5 CD's for 2010! LAYERS is keeping good company with Natalie Merchant-Leave Your Sleep; Mary Chapin Carpenter-Age of Miracles; Navigators-Sea Miner; and Chris Kokesh-October Valentine! 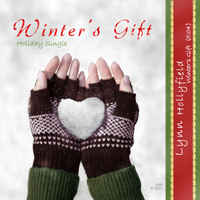 Lynn's holiday single, COLD FRONT came in at #19 for Top Songs, December 2010, Folk DJ Playlist! Cold Front is on The Hudson Harding Holiday Sampler-Volume 5 which was #2 for Top Albums on the FolkDJ December Playlist. Mark Michaelis, WGDR Folk Music Director-Host; Acoustic Harmony, 91.1 FM, VT listed LAYERS as one of the Top 20 New Releases - WGDR New Folk /Americana Library consecutively for the months of August & September, October, November & December 2010! June 2010 LAYERS was on the FOLK DJ Charts is Number 13 for TOP ALBUMS of JUNE 2010; Lynn Hollyfield was Number 19 for the TOP ARTISTS OF JUNE 2010. Steve Clarke, Host: Acoustic Planet (Thursdays 8 to 10 pm), Erin Radio -- CHES 101.5 FM, Streaming Broadcast: www.erinradio.ca, "What a terrific album you've created with LAYERS, It's my pick of the month (June) here on Acoustic Planet." 1995 MASC: Finalist: Feel Like Seeing You, Talkin' Funny-Hon. Mention. 1993 WAMMIE NOMINATIONS: Hollyfield & Spruill received 5 Nominations-Best Folk Album, Best Acoustic Duo, Best Debut Album, Album of the Year, Best New Artist/Group. 1992 MASC: Semi-finalist-For All You Bring and Honorable Mentions: Oh Brother & Tree Blues. Layers is a collection of ten original songs and a couple of well-chosen covers. Her indie-folk-pop style would have gone down a treat 25 years ago when she would have been opening up for 10,000 Maniacs or Cowboy Junkies, and it still sounds pretty good now. Hollyfields' voice is strong and seductive, and her songs are warm and inclusive. Her version of the classic "Dream A Little Dream Of Me" strips the song back but takes no rash liberties with either tempo or arrangement. The title track � one of her own � is a beauty, which harks back to the best work of goth-folkies All About Eve. "I wanted let you know how very much I love "Layers"...The title absolutely does it justice and what I love so much about it is that it's such a lovely collection of songs that are interwoven together so specially that it's just a delight to listen to from start to finish...... Definitely one of my favorite releases of this year!" Layers on of the Top 20 New Releases - WGDR New Folk /Americana Library - August, 2010. "What a terrific album you've created with Layers. It's my pick of the month here on Acoustic Planet and I'm sure it will quickly become a fave with the audience. This is an album that starts with a voice that wraps itself around you like a blanket, is held together with crystal clear recording and followed up with incisive lyrics and superior instrumentation. This one's a winner!" John Rumsey, Four Strong Winds, KVMR 89.5FM "Every year a new artist comes along and captures my heart. 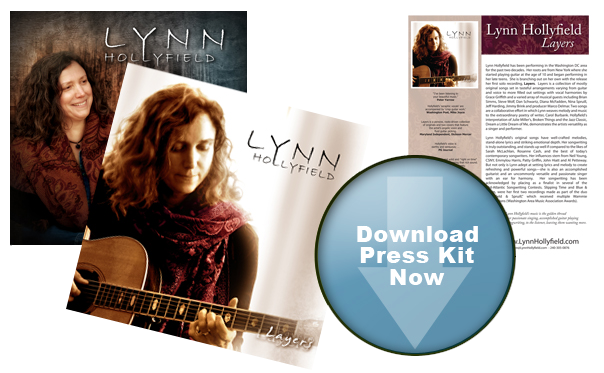 Washington DC artist Lynn Hollyfield, in her first solo, full length release, is this years discovery. She has a voice so warm and lovely it makes you want to run out and buy concert tickets. Most of the tunes are self written and are hopeful. Grace Griffith provides marvelous harmony vocals on many tracks. Adding to Lynn's fine guitar work are a wealth of talented musicians who provide layers of instrumental support. A worthy first effort bound for my top 5 of 2010. Lynn, your album is one of the best releases of 2010." iTunes Customer Review of LAYERS, "Great Album (Five Stars)"
"My Dad popped this in the car today after school, and I loved it! The music was so passionate and wonderful. Buy this album, it's great! Lynn made me smile after a crappy day : )"
"What a GORGEOUS CD Lynn!! The whole package - the sound, the cover art, the graphic design. Just beautiful! I just love hearing your voice. So rich & gentle & comforting/inviting. My favorite so far is Late Summertime.... ;-) Congratulations!" "Thank you so much for sending along your CD. It is one of the most beautiful I have heard in a long time. It really made me actually enjoy the terrible rush hour commute. I love all the songs." "I've been listening to your CD- it's beautiful - I could listen to your voice all day. A most gorgeous tone. " "The warmest voice since Christine McVie." "What a wonderful CD you have created. I'll be soaking it in again tomorrow..."
Thanks for inviting me to participate in this momentous evening. Your performance was truly inspired and your songs are wonderful. It was also a pleasure working with the first class team you assembled. I very much look forward to making music with you in the future. "Thanks for bringing us all together and letting us be a part of your music." "You were great! What a fun concert! It was a joy to be there and to listen to you sing. Thanks!" Karen H.
"Just wanted to drop in and say that your concert was fantastic last night! I greatly enjoyed it . . . you were fantastic! :)" Noah U. "Your band really kicked - great group of musicians - talented and tasteful you were beaming and looked so comfortable and happy! " Frank K.
"Thank you all again for a wonderful concert yesterday evening!" Kirsten W.
"Congratulations, Lynn. An AMAZING evening." Carol B. "Your concert was fantastic! You were just shining..." Kirsten W.
"Splendid CD! How marvelous to savour these songs! It's wonderful!!" "I truly enjoyed your music and performance. Your work is just beautiful and powerful." "I love your new cd. I just keep listening!" Please copy and paste the following code to place a link to Lynn Hollyfield on your site or blog.